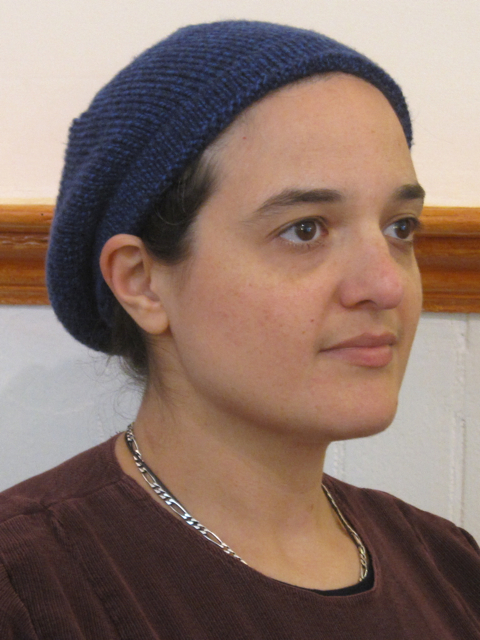 I needed something to keep my hair out of the way, so I tried making a hat with elastic in a hem rather than ribbing. I really like how it works so now I’m making more. I started at the bottom ribbing, as usual, except I made a looser cast-on than normal. This is so I can pick up the loops as stitches later. I could have started with a provisional cast-on and then used live stitches, but this works fine. You can find an example of joining live stitches (and different numbers for each layer) on another hat I made. To join the layers together, pick up the cast-on edge the same number of stitches and fold up the hem so the two needles are next to each other. 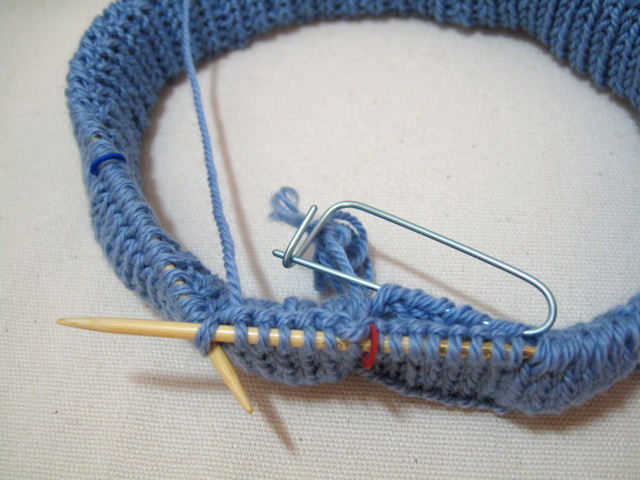 Then slip one stitch from each needle to alternate on the main needle. 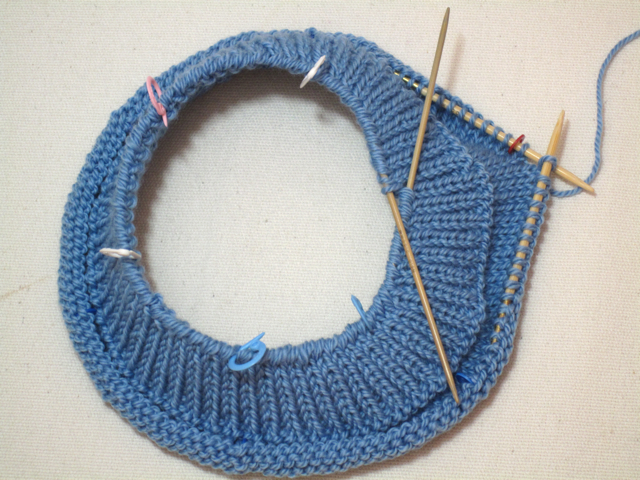 Knit the round, two stitches together each time. The way I knit, K2Tog with the live stitch first and the picked-up loop second works best. You may need to do a different kind of decrease. Leave a few hem stitches on a holder for later so you can insert the elastic. Insert some flat elastic (I use 3/4 inch non-roll waistband elastic) adjust to fit and fasten down the remaining stitches from the holder. I used sport-weight yarn and 120 stitches. This is exactly what my gauge swatch told me my head measurement should be, so normally it would be a few too many for a hat. But the elastic makes the band fit right, leaving the rest a little oversized. Posted by feorlen on 19 June 2010 at 4:11 pm under knitting. Several people have asked me what do you get for doing the COE. Well, you get a mention in a magazine and sometimes people are impressed. Other times people are impressed that you put up with all the nonsense to finish it. I have a new item for my textile resume. Mostly it seems that is about it. One thing I wasn’t expecting is to be asked to submit something for a show. A few weeks ago, the president of HGA called me (the day after we moved, to be exact) and asked if I had anything to display at Convergence in June. If I had more notice, I might have been able to make something new. But I decided to send the two knit hats. I’m cleaning them up and we’ll see how it goes. I have no idea what to expect, other than the conference is having a display of work from recent COE recipients. The president is also the director of the COE program and is looking to promote it. Posted by feorlen on 6 May 2006 at 8:33 am under spinning.